Both in India and the US, investment Research has been making news but for all the wrong reasons. On Wednesday, Nov 26, a research analyst was reportedly remanded to custody by a Gurgaon (India) court on a complaint filed by a company whose stock the analyst covered. In 2011, the analyst’s report on the complainant company’s stock was seen as a trigger for a heavy selloff in that name. In 2012, the analyst published another report on the complainant company subsequent to which the company is said to have filed a suit in India against the analyst and other associates. The Research firm where the analyst worked, too, has been reported to have filed a suit in Canada against the complainant company. Separately, notably, the group of companies associated with the complainant company, was criticised by India’s securities market regulator last year – SEBI – for holding six annual general meetings in a span of seventy five minutes. The claims and counter claims between the analyst and the complainant company remind us how fragile the atmosphere can be in which the investment community is operating. Irrespective of who the wrong doer is, potentially expensive litigation, trust deficit and uncertainty may have created another wall of worry for the publishing analyst. How “free” then is the analyst community from greed and fear in doing their jobs? An exercise conducted to investigate Analyst Research recommendations confirms a bias that analysts could be facing in assigning a “Sell” recommendation. Recommendation data (as of Nov 27, source: Bloomberg) tells us that the average Sell side analyst in India has not been as willing to put a “Sell” rating on stocks. This may not be an entirely new revelation. But the extent of the bias against “Sells” in India is uncomfortably high and stands out. On average, India’s (NIFTY) sell rating percentage is at 13.4% – the lowest among world-wide markets that were analysed. 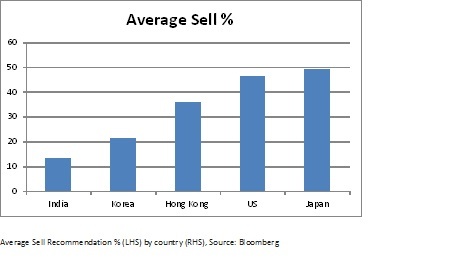 This compares with an average “Sell” rating of 49% in Japan (Nikkei), 46.4% in the US (S&P 500), 35.7% on the HSI and 21.5% in Korea (KOSPI 200). One could argue that the latest low average “Sell” rating in India is a result of the current bull market sentiment. But even in the worst of the market moves – 2014 and 2011 – India’s average “Sell” ratings peaked at 14.7% and 15.5% respectively. What are the pressures that could be dragging the Sell side analyst to a mediocre report? In India’s case, an average “Sell side” analyst has to typically compete with tens of peers. Axis Bank for example is being “covered” by sixty seven analysts (Bloomberg data). The annual brokerage commission for the top liquid names in India could be pegged at around $500mn (assuming 20 bps commission). Given the coverage abundance (67 for Axis Bank) that India has, sell side firms may be in a number of tight races (research, corporate access, trading) for market share in a relatively smaller market compared to the developed world. Significant competition and an uncertain revenue pie are a long term structural pressure that the analyst has to face. In terms of stakeholders, for the Sell side analyst, important parties include the Buy side, the companies being researched and the regulator. Companies, quite naturally, do not like a “Sell” recommendation on their stock. Many a reputed CEOs have on record, expressed their dislike toward the earnings season and in responding to questions from the analyst community (Who Says Elephants Can’t Dance – IBM, DELL going private). But openness to criticism, avoiding prejudice against critical analysts would be required from the corporates to create an environment of fearlessness. Maintaining informational access in letter and spirit to analysts who assign a “Sell” rating is an area that may need support from both the corporates and the regulator. The regulators could look at improvising mechanisms for fair and open access to corporate information. Above all, the “Buy” side, through their retail investor representation are in a position of significant influence to persuade not just the regulators but also the overall culture in the investment community. The markets on one hand need the independence and objectivity that an analyst is required to bring to a recommendation. But on the other hand, unaddressed fault lines maybe creating barriers that are counterproductive to all participants. These walls and lapses highlight the need to uphold values enshrined in the CFA Institute’s Code of Ethics for creating a robust investment canvas. Will the investment community collectively and persistently, through advocacy, bring about a positive change? This entry was posted in ExPress and tagged S.P. Jain Institute of Management & Research, Shreenivas Kunte CFA. Bookmark the permalink.